We have had a superb week. Relaxing peaceful, even blessed with great weather in April. With the milder climate of Cornwall, even the gardens have much to offer out of season and most remain open all year round. The Camellias and Magnolias start flowering as early as February and March, followed by the Rhododendrons and Azaleas. To see these in abundance a visit to Heligan Gardens is a must at this time of year and only a short drive away, or if you fancy going tropical, step into another world and visit the Biomes at The Eden Project. Of course, the wonderful sandy beaches and spectacular open moors never close and you could walk on these all day and hardly see a soul. There are numerous quiet Pubs and Inns to call into for a cosy pub lunch by a roaring log fire, or for a special treat, out of season offers can often be found at the top named celebrity restaurants. At the end of the day your cosy cottage at Nanjeath Farm is waiting for you. A true 'home from home' with double glazing, full central heating and the perfect ambience and ease of a quality electric wood burning stove to snuggle up to before turning into your comfy bed for a blissful night's sleep. Our short breaks in Cornwall start from the end of October until Easter (excluding Christmas). They can start and finish on any day of the week, but must be for a minimum of 3 nights. We can sometimes take short breaks at other times if we have a last minute availability, so always ask. 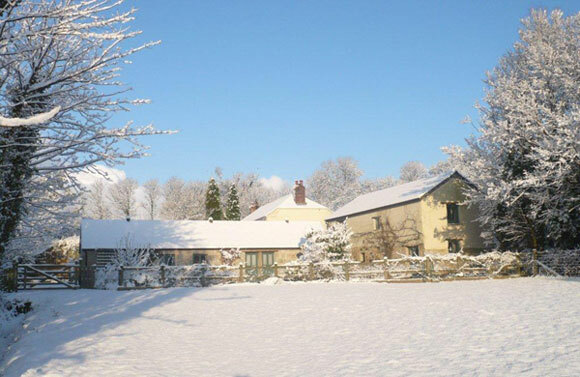 Nanjeath Farm is the perfect place to spend a truly relaxing Christmas. Each cottage is tastefully decorated with holly, ivy, and a real Christmas tree and you are welcomed with mince pies with Cornish clotted cream. Why visit Cornwall in autumn, spring or winter?